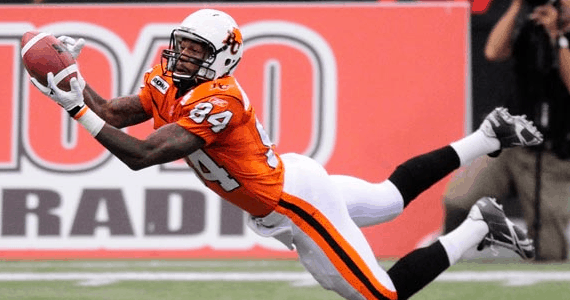 Receiver Emmanuel Arceneaux had a great rookie season for the BC Lions, and became a big art of their passing game. He recently took time out of his off-season to answer a few questions for BCLionsDen.ca. Lions fans can follow Emmanuel on Twitter @emannie84. BCLD: Emmanuel, thanks for taking the time to talk to your fans at BCLionsDen.ca. You had a big impact on the Lions receiving core this season in your first year. How much did you know about the CFL before this past season? EA: I knew very little about it because much of it isn’t aired in the States, but my agent Ken Austin had brought it too my attention. BCLD: Following you on Twitter (@emmanie84 for those who don’t know) it’s obvious you are very dedicated to trying to get better. How much time did you take off after the season ended, and can you describe your workout regiment now, and how it might change as the season gets closer? EA: Well, I took off about 2 weeks to let my body recover after the hit I took in the eastern finals by Davis Sanchez. It left a a stiffness in my traps. I also had to to make sure my hand was okay, because i broke it in the Edmonton game when the weather was freezing. That was the last minute victory we came away with after the awesome catch Geroy made. I’m currently lifting at my high school and doing the workouts given to me by the strength coach, but for my endurance I usually jog about 3 to 5 miles. Once the weather warms up I’m going to begin my sprints. Earlier this week I got a membership to the YMCA so now I’m taking Yoga and Pilate classes and man its intense! But as i get closer to the season im going to focus more on route running and my health like im doing now. Mentally and physically I want to be at another level so when i come into camp I want the world to know I’m serious about my profession. BCLD: How much did you learn from veterans like Geroy Simon and Paris Jackson this season? EA: Geroy taught me how to love the game and use the tools that I have to make it harder for opponents to cover me. He is an excellent guy to learn from, plus he was kind enough to take me under his wings and polish me as a WR. Paris taught me to be furious and play with heart and to never back down. He brought more of the physical aspects to the game and I like that about him. But when you’re in the huddle with 2 great wide receivers you cant help but want to perform on the highest level possible. BCLD: In your opinion, what is the biggest thing you want to improve on in your second year? EA: I want to improve mostly on hand placement when catching the ball and staying low in my route running, meaning I want all my routes to look the same when I hit the line full speed. I dont want to be predictable when teams watch film on me. I also want to improve my speed and quickness and plus play at a more intense level. BCLD: In the Eastern Final you made a spectacular catch and landed awkwardly on your neck. A lot of people were amazed you weren’t injured. Can you describe the play and were you hurt at all? EA: To be honest I dont believe in being hurt, but I had to make that catch because I dropped a ball right before that, due to being so anxious of trying to make plays instead of letting them happen. But I wasnt injured at all, just a little scared because my trap muscles had spasms in them, so as i walked to the sideline I just prayed for God to give me strength so I can make it through the game. My first time seeing the hit was like a week later. All he did was take my legs from under me, so it really wasn’t a big hit, but thats why I’m training like I am because I refuse to be hit like that again, so im getting my weight up plus when I return I will be bigger, faster and stronger. BCLD: Does the number 84 have any significance? EA: Yes, it’s my first professional number. Wally gave me an opportunity that no one else gave, and that was an opportunity to be apart of his BC Lions football team..so whether we’re down or winning, I need to find 84 ways to be successful in the course of the game! BCLD: Where is home for you, and what do you enjoy spending time doing in the off-season in your free time? EA: Alexandria, Louisiana is home for me. I most of my time spend time with my homeboy Dewayne Dupar or I’m at Platinum Styles barber shop. I just got a Playstation 3 and Madden 2010 is awesome, so if anyone out there wants to play me, my online id is: emmanie84! I’m just glad to be with my family and I’m a mama’s boy. I also attend church on Sunday and more than anything I’m glad to be able to give back to my community by speaking to the youth and training athletes at my High School. BCLD: Emmanuel, thanks for taking the time in your off-season to speak with us, and all the best to you next season, Lions fans are very excited to see what you can do in year two!